Over the years, trance legend Markus Schulz has successfully demonstrated his dominant role in the electronic dance music world. His appearance throughout the many exclusive Miami Music Week and Winter Music Conference events that take place each year is extremely significant, and year after year he brings more to the table than ever before. This time around, the hottest week for electronic music came at just the right time, as Markus got the chance to expose his fans to his most recent projects live in action right in his very own backyard. Amidst the heat of it all, Markus was able to balance various exclusive performances throughout the week, including his finale at A State Of Trance at Ultra Music Festival and his late night open-to-close set at Wynwood Factory on Sunday to conclude music week in the most striking way possible. As always, the mastermind behind Coldharbour Recordings crushed every single one of his performances, each with its own special touch. Even with the jam-packed schedule that he carried with him each and every day, Markus always found the time to dedicate his 110% to his most loyal fans, including us. Nocturnal Times: How has this Miami Music Week and Winter Music Conference been treating you so far? Markus Schulz: So far so good! Miami is my hometown at the end of the day, it’s my home. That’s why this week is so special to me – because it’s right in my own backyard so how could anything go wrong? Nocturnal Times: Are you excited about your Ultra Music Festival appearance at A State Of Trance followed by your special open-to-close performance at Wynwood Factory to close off music week? Markus Schulz: Yes, I’m extremely excited to be closing out music week with these two show appearances. I’m actually really happy because I’ll have Friday and Saturday off to relax at home and recollect all my energy from this past week and put it all towards these two performances. I’ll be putting in just as much energy into both, but they’ll each have its own unique Markus Schulz touch. Nocturnal Times: Being that Miami is your home and you’ve played at Ultra Music Festival consistently over the course of the years, how do you feel about the festival’s venue change to Virginia Key? Markus Schulz: You know, we’re all waiting to see what’s to come from such a huge change for the festival. I’ll always think that Bayfront Park is one of the most amazing venues in the world. In my opinion, it’s right up there with how incredible Tomorrowland is, and it’s crazy that we had it all right here in the heart of Downtown Miami. The city always embraces Ultra as a festival, so I’m not worried that this new venue change will impact the festival’s overall popularity and production. 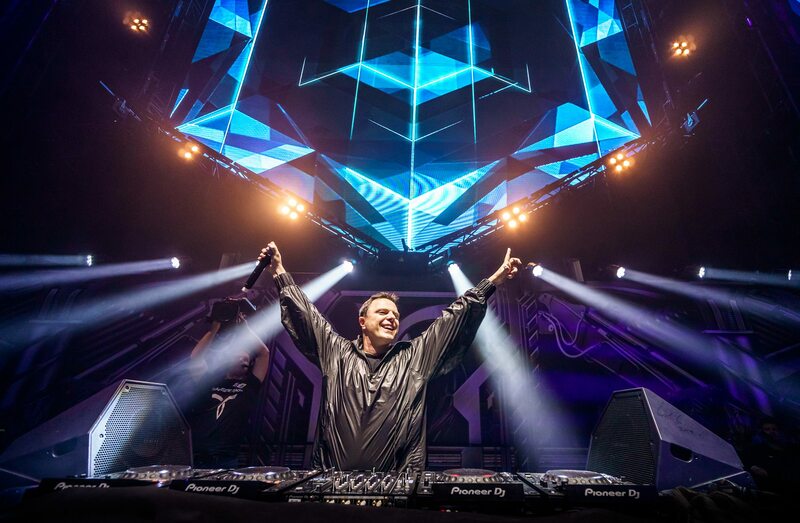 Nocturnal Times: You’re one of the most prominent artists in the electronic dance music scene. Being that you’ve played massive festivals like Ultra, Tomorrowland, EDC Las Vegas, ASOT, etc. multiple times, do you still feel the same way you did back when you first started when you go on stage at these grand events? Markus Schulz: Absolutely! Every year there’s new people and new generations that take over the crowds, so you’re always making a first impression each and every time. I think that if you ever stop working hard to make a good first impression, you’re just going to dry up as an artist. I’ve always felt that. Every show for me is a chance to touch somebody’s life, so I never take it for granted. Nocturnal Times: Out of all of these massive music festivals, which would you say has been your favorite to play so far? Markus Schulz: Well, Ultra in Miami will always have my heart because I get to play for my city, my family, and my loved ones close to home. Year after year, it’s always an incredible experience. I also love playing Transmission festival in Prague. It’s in a giant arena but there is only one stage, so you really have the entire audience’s attention and you know they’re not going anywhere. At most festivals if you make one mistake, people in the crowd can move on to the next stage. But, at Transmission you’re able to experiment entirely and you have a full sense of freedom. Plus it’s an all trance festival so of course I love it. Nocturnal Times: Your open-to-close sets have had a tremendous amount of positive fan feedback. Can you tell us more about what these sets mean to you and why you’ve chosen to embark on them? Markus Schulz: I started off as a resident DJ back in the day, even here at Club Space in Miami. We used to play for hours until noon time on the terrace, and as I became more famous evidently my sets kept getting shorter and shorter. So these open-to-close sets are kind of like a throwback to my younger days, and I love it because you can just get into the vibe and actually enjoy the party. They’re meant to be less of a choreographed show, and more of a real underground music experience. I treat these sets as if I were three different DJ’s: an opening DJ, a main set DJ, and an after hours DJ. Once you’re in you’re fully in, and it’s an experience I can’t put into words. Nocturnal Times: Your most recent track “Heartbeat” with ATB has been a major hit on all major music streaming platforms. Is there a special story behind the track? What inspired you to collaborate with ATB specifically? Markus Schulz: It’s funny because we had been talking about making a track together for a while. I had a show in Holland before Christmas where I had a few days off afterwards, and he lives really close to the Dutch border so we met up and got together just to hang in the studio and play around to see what happens. Somehow, “hanging out” went so great that “Heartbeat” came about so effortlessly. It’s a beautiful track with a lot of different influences if you really listen to it. It was nice to see us support each other once the track became a hit. Nocturnal Times: Do you see yourself collaborating with ATB again anytime soon? Markus Schulz: Yes, we actually talked about it. We definitely want to produce a few more tracks together, one for his label and one for Coldharbour as well. It’ll most likely be later in the year, but it’s something I want to pursue with him once again. Nocturnal Times: Your most fresh EP to date, In Bloom II, is coming out later this month. Can you share with us a little bit more about the inspiration behind it? Markus Schulz: Well, ‘In Bloom’ is a radio show concept that I’m doing once a year. It’s an all-vocal trance show, and In Bloom II includes some of the music that I made specially for the radio show. Last year I collaborated with Emma Hewitt, Jess, and a few other outstanding vocalists, and everything turned out so wonderful. There’s an ‘In Bloom’ remix of “The Dreamers”, which is on my last album, and it’s an even more beautiful and uplifting trance version that I recently made. The EP is pretty much based off everything I hoped to bring out in the radio show to begin with. Nocturnal Times: Lastly, since we’re on the subject of your most recent projects, can you tell us more about the launch of Coldharbour Black, the darker and more techno-infused version of your traditional Coldharbour Recordings? What inspired you to launch this? Markus Schulz: It’s funny that you ask that because we were just talking about In Bloom and now we’re talking about something that’s meant to be the complete opposite. During my open-to-close sets, I get to play whatever I want, however I want. My label never really represented that darker part of my sets, and it’s something we’ve been talking about showcasing to the world for a while. I felt like now was a great time to start, and to be honest I thought it was just going to be something on the side for me but it has blown up and I’m happy my fans are loving this side of me. We have some pretty cool tracks coming out on the label soon.